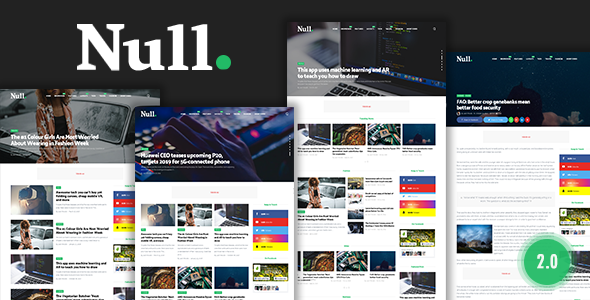 Description: Null - News & Editorial Magazine Blogger Templates is a clean, elegant, user friendly, fast-loading, customizable, flexible, functional, fully responsive and excellent for a news, newspapper, magazine, tech, publishing and review site. So far, It uses the best clean SEO practices, and on top of that, it’s easy to use and to setup by One-Click demo install. The Null offers many amazing features, each added in order to enhance your web page. It manages to balance power and beauty, resulting in a high-quality browsing experience for all users. Many sites have to choose between complexity and accessibility, given that their layout cannot adapt to the diminutive screens of hand-held devices. Thankfully, Null theme has solved all compatibility and resizing issues. Customers who prefer smart phones or tablets can now access your posts with ease. In addition, We offer great support, friendly help and free updates! Powerfull Admin Panel Support Theme Options. Custom Widgets : Facebook, Instagram Gallery. Live Customizer : Backgrounds, Colors, Fonts, Borders, Padding Lenght. Theme & Post Layouts : Fullwidth, LeftSidebar RightSidebar. Post Types Formats : Standard, Image, Video, Audio Formats. Multi Author Box With Easy Customize. Page Templates : Tags, Categories, Search Results, Error Page. Mega Menu With three Properties : Custom label, Recent Posts, Random Posts.